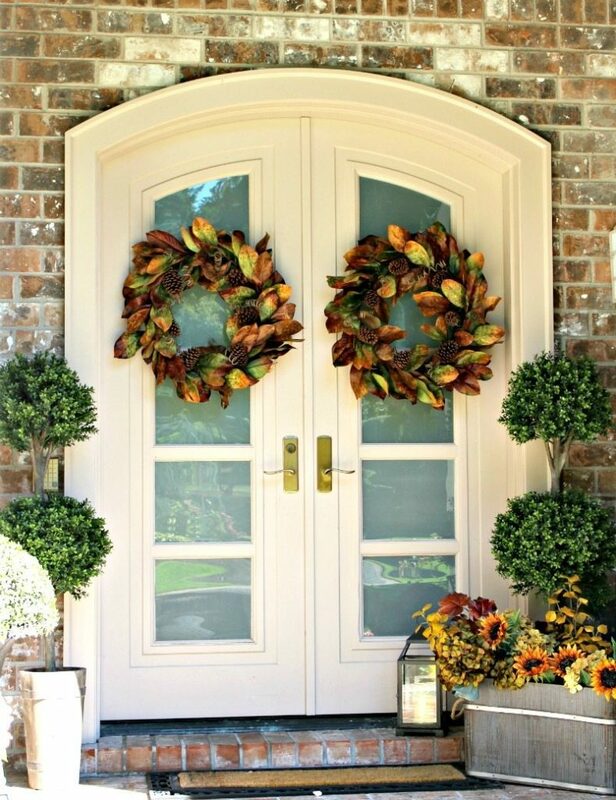 Julie’s Fall Home Tour: Welcome! Welcome and thank you for stopping by! I have so much fun decorating my home and hope that above all, it shows! I don’t follow a lot of design rules, but try to follow my own design aesthetic and have fun. Since my tastes change all the time (and I get bored easily) it falls naturally that I change my decor daily. So, this is my front porch. I use all faux flowers and faux plants out here. I find it easier and cost-effective. My garden just beyond is managed by my gardener, and he does a much better job of keeping things alive than I do…hey, we all have our skill sets, right? This is what you see when the doors open, my front hall entry. I probably have the most fun decorating this space. 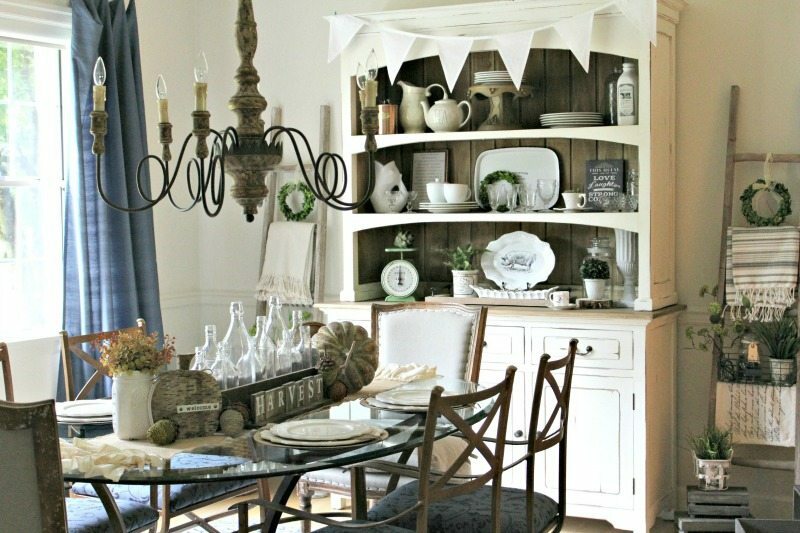 There are three separate “vignette” areas in here: the one to the left with the black chest, the bench/mirror vignette, and then the space to the right (unseen in this photo) where my farmhouse table sits. 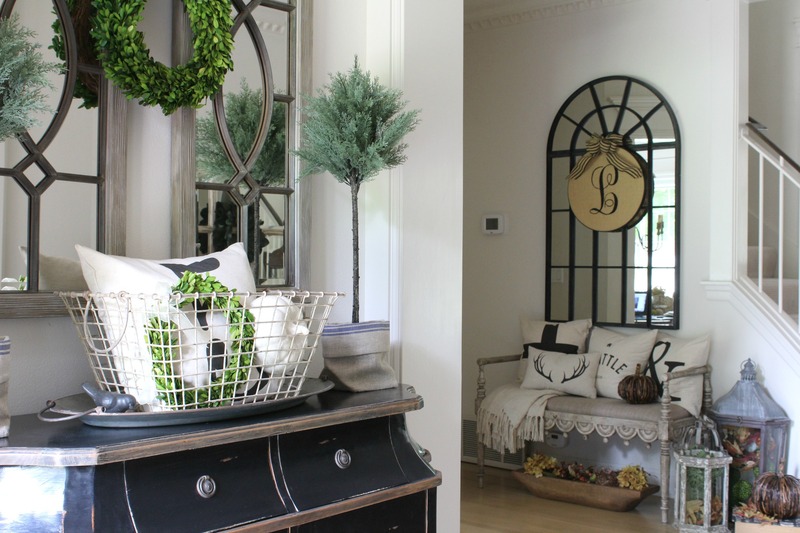 I really love using mirrors because they reflect light, and they provide a go-with-everything-neutral palette. Each mirror I choose has something that makes it a statement on its own, either a unique shape, or detail like windowpanes. 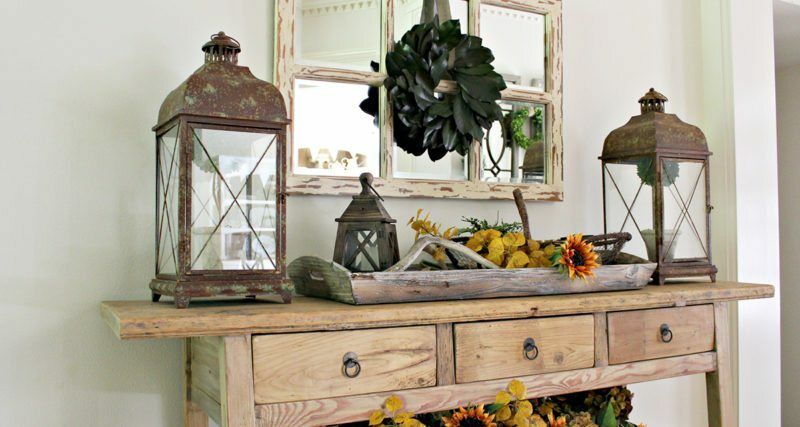 I love to decorate the mirrors with seasonal wreaths and different banners for added detail. Here is closer look at my bench vignette. I have a ball decorating this spot. My husband looked at the bench when I first set it here said to me, “That looks nice Honey, but I’m not sure if anyone will every sit there” (insert laughing emoji face) AS IF THAT HAD ANYTHING AT ALL TO DO WITH IT!!!! He cracks me up! And luckily, I crack him up. Here’s the right side of the hallway, my farmhouse table…and another window-pane mirror. Nothing here was bought with a plan. I simply buy what I like and figure it out when I get home. All of my decor is mobile (as I mentioned), so planning is irrelevant. What I try to ask myself is do I have too much of a certain purpose. For example: pairs of tall things. In my mind this is as specific as I get. I have pairs of tall topiaries, pairs of tall lanterns (pictured here), pairs of tall candle pillars, etc. I have a certain number of places in my home where a pair of matching tall decor items could possibly work (until they become back stock). You get the picture. 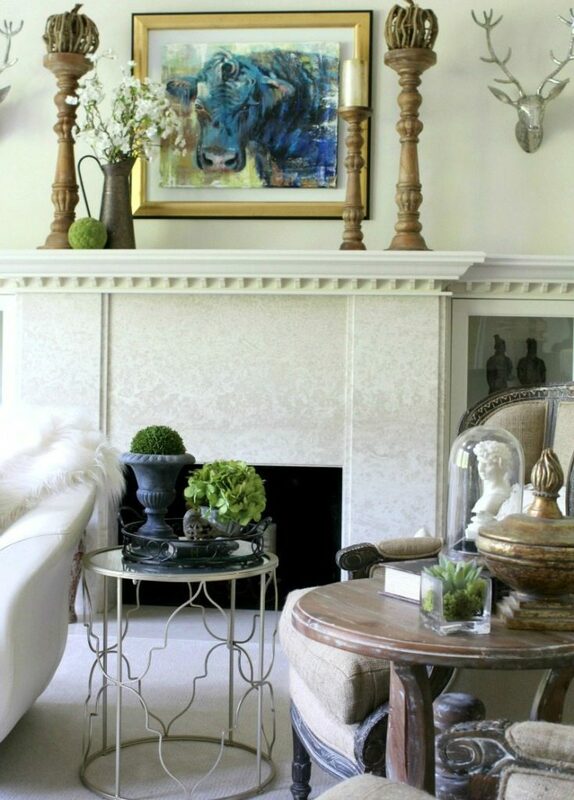 I love updating this room by changing out the vignettes (small decor gatherings) and swapping out the pillows. It’s so easy and fun, and really takes no time at all. I’ve learned to save money and space by investing in new covers only whenever possible. This is harder to do when you shop at local retailers. But it is easy when you shop small makers. The price savings is awesome. 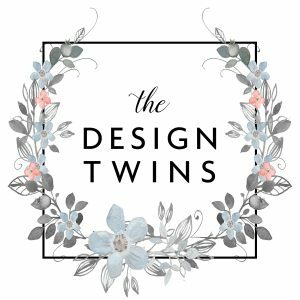 The incredible custom pillows shown here are from an amazing maker, Bianca @withlavenderandgrace Use our coupon code: THEDESIGNTWINS to receive 10% off your entire order for a limited time. Click HERE to shop her Etsy boutique. And this is my formal living room. The focal point is balanced between my baby grand piano (not pictured) and my marble-faced fireplace pictured here. Center stage is this original painting by Sophie Dentiste of The Back Home Market entitled simply, “Blue.” Please enjoy our exclusive 10% off discount code by using designtwins when you shop any of Sophie’s art. Click HERE to shop. This is the start of my fall tablescape. Because the centerpiece is so detailed I chose to leave the rest quite neutral and clean-looking for now. For a dinner party I like to keep the centerpiece low enough to see over. 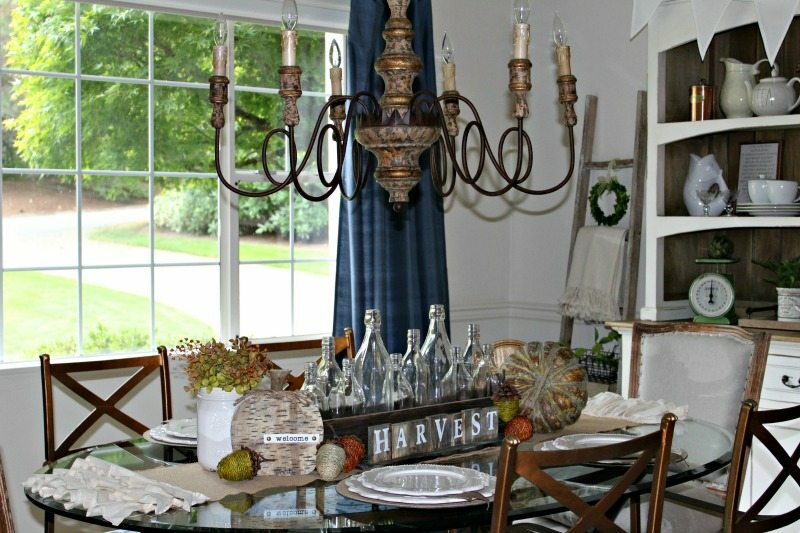 This is a brand new chandelier I just got from @antiquefarmhouse and it really has transformed this room. The ladders are from them as well! Click HERE now to shop these and similar looks. Here is another view of the dining room. 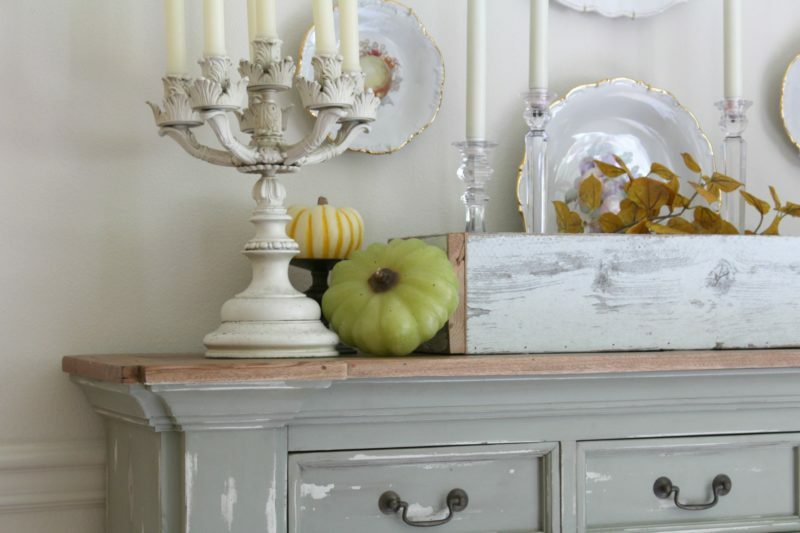 Can you tell how much fun I have decorating the white farmhouse-style hutch?? And you can better believe I have the inside FULL of out of season “back stock” decor! One of these days I need to organize it…you all would be appalled to see inside–just sayin’!!! This is also in my dining room. 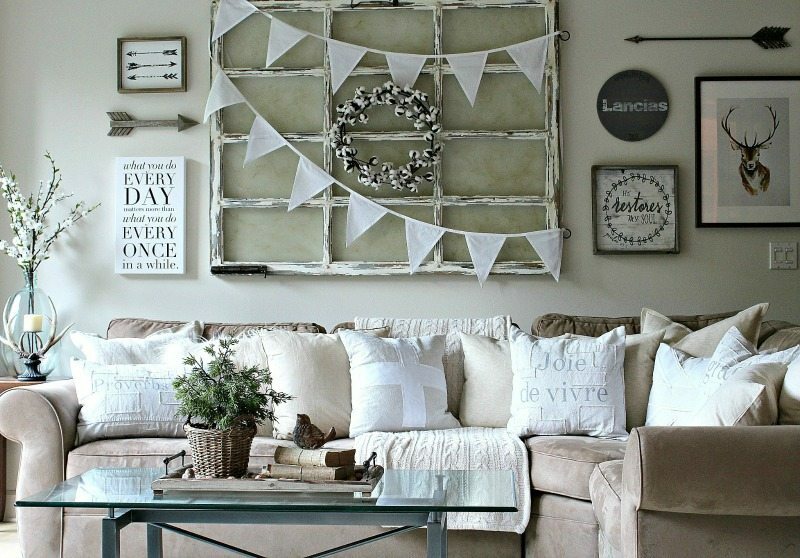 Jodie and I have an informative blog post detailing how to create a plate wall. 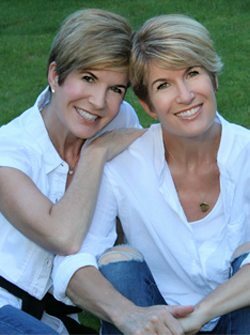 It’s not hard but with a few helpful tips you can avoid unnecessary mistakes and achieve your look more quickly. Click HERE to read all about it. As you may have noticed, I LOVE to decorate with artificial plants and greenery. I have the opposite of a green thumb so I rely exclusively on faux plants. Luckily the quality has improved greatly in the past 10 years, so I am delighted to present to you a collection of the best (and most reasonable) faux plants I recommend. Thank you for taking my Fall Home Tour. I sure hope you enjoyed it and hope you’ll visit regularly for plenty of fun and inspiration. 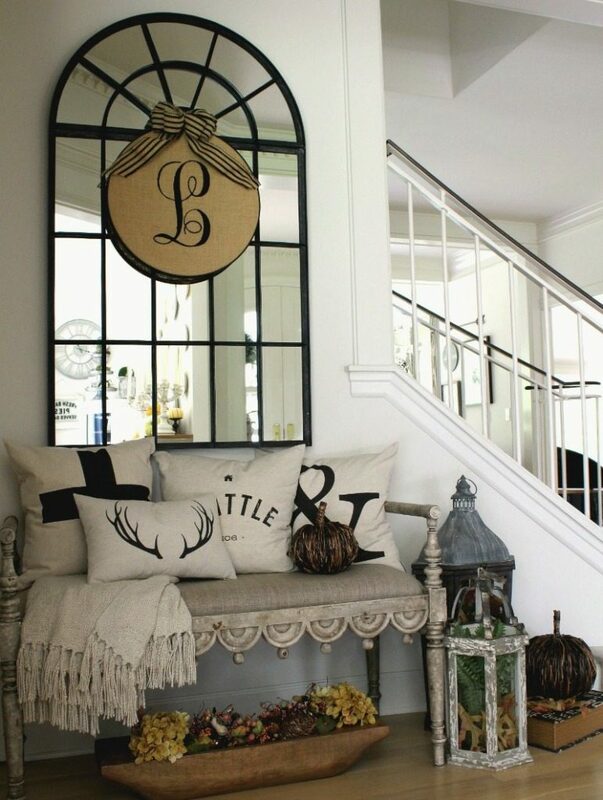 A beautiful fall home tour of decorator Julie Lancia, one half of The Design Twins. Enjoy her unique expression of fall throughout her gorgeous Pacific Northwest Home she shares with her family just outside Seattle.